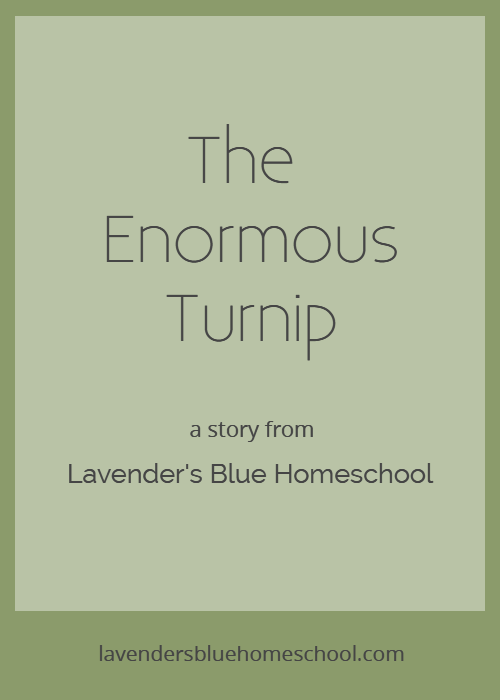 Traditional Russian folk tale (from the Lavender's Blue Kindergarten Curriculum), retold by Kelly Ehrman. This is one of our favorite kindergarten stories, one that I love to tell in the fall. It's especially fun to act this one out with little animal figures and you can change the animals in the story to fit what you have on hand. This song goes along nicely with the harvest theme as well. Enjoy! Once upon a time there was an old farmer, who lived with his old wife in a little old house. They had a beautiful brown horse (neigh), a gentle spotted cow (moo) and a sweet little cat (meow). The farmer's favorite food was turnips. He just loved turnips. So he decided to plant a whole lot of them. He plowed a big field and sowed turnip seed all over. All summer long, the sun shone bright on the field and the rain fell and watered the growing plants. The farmer waited with anticipation for the fall harvest when the turnips would be ready. Then one Autumn day the farmer decided it was time to go dig up his much-awaited turnips. He took a cart and a spade and set off for the field. But when he got there, all he saw was one single turnip! The farmer sank to his knees and wept with disappointment! But then he decided that if all he had was one turnip, he was going to pick and eat and enjoy it! So he marched over and started to pull on the greens. But the turnip wouldn't budge. He pulled harder, and still the turnip would not budge! He pulled until he was red in the face, and still the turnip was stuck fast in the ground! The farmer ran off back to his house, calling to his wife, “Come and help me! There is only one turnip and it is stuck fast in the ground!” Now, his wife was surprised that he was having trouble harvesting just one turnip, but she went along with him to the field. And the old woman pulled on the farmer and the farmer pulled on the turnip, but the turnip wouldn't budge! So they called for their friend the horse, “Come and help us! There is only one turnip and it is stuck fast in the ground!” The horse said, “Neigh,” and he pulled on the old woman and she pulled on the farmer and he pulled on the turnip, but the turnip wouldn't budge! So they called for their friend the cow, “Come and help us! There is only one turnip and it is stuck fast in the ground!” The cow said, “Moo,” and she tugged on the horse, and he tugged on the old woman and she pulled on the farmer and he pulled on the turnip, but the turnip wouldn't budge! So they called for their friend the cat, “Come and help us! There is only one turnip and it is stuck fast in the ground!” The little kitty cat said, “Meow,” and she pulled on the cow, and the cow pulled on the horse, and the horse pulled on the old woman and the old woman pulled on the farmer and he pulled on the turnip, and the turnip came flying out of the ground and they all sat down with a Thump! For it was the most enormous turnip any of them had ever seen! They all worked together to push and roll that turnip back to the house and it was so big that they all could munch on turnip as much as they wished all winter long.